This is a “master list” of restaurants that I have seen on the Internet or other sources and would like to try, or that I think would be of interest to others. I do not mean for this to be an exhaustive list of every good place to eat, but it should represent a good sample of the most interesting or unique restaurants, along with a few that best represent an area’s regional cuisine. Geographic Coverage: This list came about as a result of search tools that were available on the old Urbanspoon.com web site so that I could compile a list of what I thought might be the best restaurants in any city, region, or state. The “best” is subjective, with a high priority given to ethnic restaurants and regional specialties in each state (it is what I would look for when traveling, and I do not claim anything more than this). Urbanspoon was purchased by Zomato.com, and I found that the former search tools were no longer available (nor is there anything similar on other web sites). As a result I am planning to limit the geographical coverage to the states I was able to research while Urbanspoon was on line. Of course I use other sources to complete the list, but the skeleton of it was only possible while Urbanspoon was available. 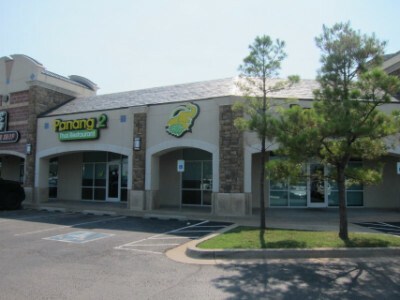 Panang 2 and Tana Thai are two Thai restaurants on North May Avenue in the Quail Springs area, and in my opinion they really could not offer more of a contrast and still be classified as Thai food. 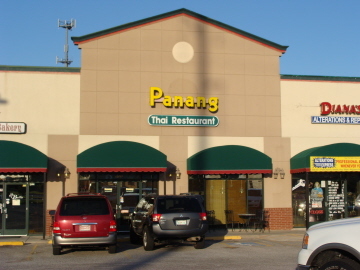 Panang is part of a “mini-chain” of three restaurants (No. 1 is in south OKC and a third restaurant is in Edmond). Tana Thai is a small family owned restaurant with more limited hours and seating, so I would say Panang is more upscale. The menu is much larger at Panang, although Tana Thai covers all the basics. 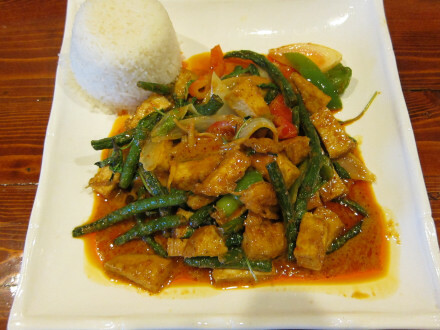 One of the biggest differences I have noticed is in the portion size–Panang gives what I consider to be very large portions compared to the “normal” Thai restaurant (and to Tana Thai). Panang is in a more modern building with what I consider to be a better parking lot. Many of Panang’s dishes have received a lower rating from me because they are sweet for my taste. Many of the dishes at Panang also have MSG, while the ones at Tana Thai do not as far as I know. Overall I consider Tana Thai to have better food, but with at least one notable exception (that being the ginger stir fried). The prices are about equal at both restaurants, so those who think the food is better at Tana Thai (as I do) also have to consider whether it is worth it to get what are generally smaller portions. Panang’s multiple locations indicate that it has a loyal following, and I definitely understand the reason for this. It has a comfortable atmosphere even if you come during off hours (such as the middle of the afternoon), take out orders are reliable, and Thai food is one of my favorites. The prices are reasonable for the quantity served, and I have never gone away hungry from any of their meals. After eating the panang curry I made a note that it was easy on the stomach (this must have been when I was having some digestion problems), but I would say that Tana Thai is the same way. My preference for Tana Thai does not exclude Panang from being a good choice as well. 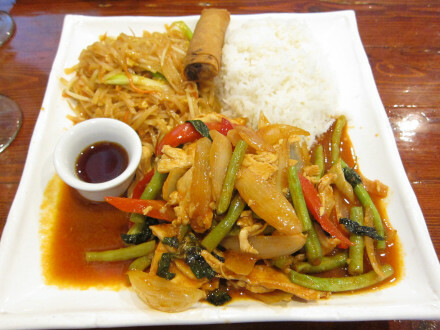 Panang has lunch combo meals Monday through Friday until 2:00 P.M. which give you a lot of food for prices that are a good deal lower than most of the dinner items. The choices change daily, but one I thought was fairly good was the Basil Chicken served on Wednesday (they also have basil pork on Monday and basil beef on Friday). The lunch combos come with four items, but there is large flexibility in choosing these items (or you can get a double portion of any item). The one in the above photo came with rice, spring roll, and pad thai, along with what I thought was a generous portion of basil chicken. While the basil chicken was not as spectacular as Tana Thai would serve it, I still though this was a good meal (the green beans were crisp and everything on the plate was good). I am not a huge fan of the spring roll, and customers are allowed to substitute something else for it, but I think it goes well on the lunch combination plate. I had heard that the Green Curry at Panang was one of the best items, so I ordered this lunch combo when I came on a day that the green curry was available (my records show that it was a Thursday). I ordered it with a double portion of Pad Thai (the curry was very good but I think it would probably be better to skip the pad thai or just get a single portion of it). 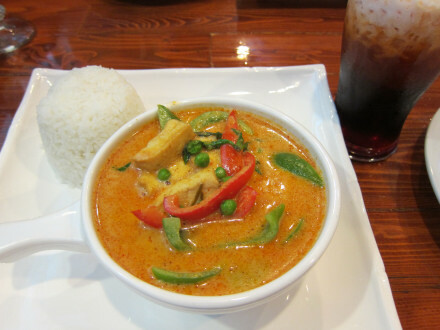 Many dishes from the main menu are not available on the lunch, but in my opinion it would probably be worthwhile if they have the green curry, panang curry, or basil chicken. 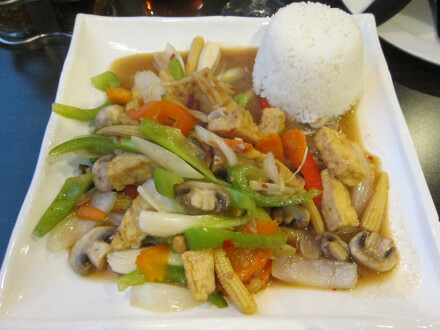 The Ginger Stir Fried dish is the item I have tried that I think is notably better than its counterpart at Tana Thai. I thought the blend of flavors was very good, and I appreciated the fact that Panang serves large portions on its dinner menu (I do not believe this item is available on the lunch special). There is a choice of different meats or tofu, and I thought the large amount of vegetables made it better than many dishes served at other restaurants. It also had a strong ginger flavor (one of the reasons I prefer this to the one at Tana Thai). Another good dish is the Spicy Stir Fried (this one was also with tofu). This was made with a curry paste (made without coconut milk) which possibly makes it more flavorful and less sweet than the regular curries. There was a good basil flavor to the dish, and the green beans were a very good touch. 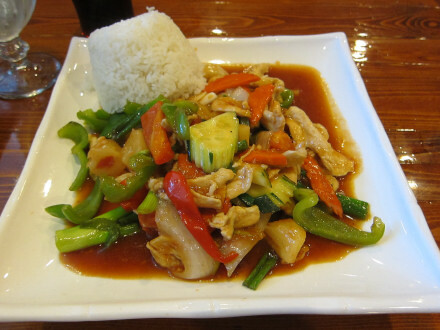 To me the Sweet and Sour Stir Fried was pretty much devoid of Thai flavors, and would not be one of my first choices for ordering, but the chicken and vegetables were good. The two curries I have tried so far have been good choices, although I was informed that the curries are all made with MSG (so far I have not noticed that it is a problem for me when I eat the curry). The Panang Curry was especially good because of the lime leaves, and I would recommend this dish in spite of its sweetness and the MSG (which did not seem to be in a very great amount). The Green Curry (shown in a lunch combo photo) is often cited by on-line reviews as the restaurant’s best dish, and I would also say it is a good one (but I would probably give the nod to the panang curry). 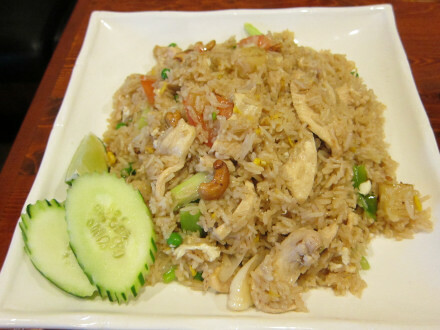 The Pineapple Fried Rice seemed to be fairly devoid of flavor, although it can be made better by adding your own chiles from the condiment bar. My main problem with the Thai Tea here is the price. I definitely think it goes well with the food here, but it is more expensive than if you are getting regular tea. This photo also shows the Thai condiments which are available, and which I think have turned some mediocre dishes I have been served into good ones (a good thing to keep in mind since the condiments are free). The spice level is higher than at other restaurants, so usually one star is enough for me (although the panang curry comes with a default level of 2, and I thought it was about right for this dish). A waiter at Panang told me, though, that pad thai and fried rice use dried chiles which have a lower heat level than on the other dishes. I know that the curries have MSG and the ginger stir fired does not, but I do not know about the other dishes. I believe the MSG is used in small quantities, though. 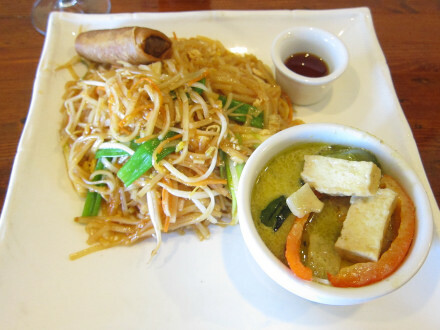 Most of the food here is very sweet, and because of that I generally prefer other Thai restaurants. The ginger stir fried had a flavor that I thought was very good, though (with a good blend of flavors). The lime leaves make the panang curry special in spite of its sweetness.